The Culchie Festival takes place annually in the town of Athboy, Co. Meath. 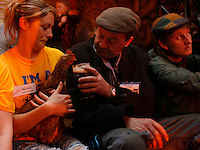 The festival embraces the stereotypes of the Ireland's rural farmers, and provides an excuse for participants to run amok drinking and carousing through mock contests, as well as nearby towns, farms, pubs, and even wedding parties. The derogatory term "culchie," similar to "redneck," is used by natives of urban areas, especially Dublin, to describe people from outside the city.